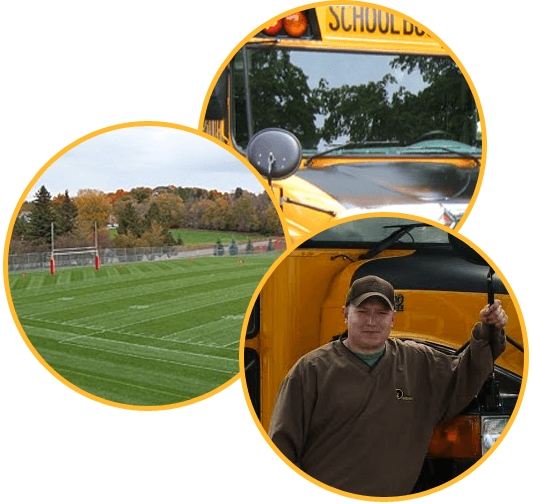 4.0 School Services is a friendly, skilled, community-focused school services company offering transportation, grounds keeping and consulting services to school districts throughout the state of Minnesota. We are comprised of experienced professionals who are passionate about their purpose, dedicated to their profession, and committed to forming lasting partnerships with the communities they serve. We see ourselves as an integral part of every community with whom we form a relationship, supplying a variety of critical services that allow administrators to focus on the education of their students. We are committed to being the seamless link between schools and parents, providing a safe, secure, and positive transportation experience for all children, along with the peace of mind these elements bring. We especially believe that some of the most valuable and important relationships we can maintain are with those who are already a crucial part of a school’s existing transportation department. We are dedicated to serving all facets of a community, providing at our own expense for some of the transportation needs of community-based organizations whose budgets may be limited. We continuously strive to be a company of high standards and excellence, providing a safe and efficient transportation system along with a comprehensive resource for school services within a districts current financial structure.